For the opening of the Peel Line in 1873, the Isle of Man Railway included in its initial stock purchase from the Metropolitan Carriage & Wagon Co, four hand-braked covered goods vans with load 6 tons and central double-doors to each side. The covered vans were allocated the stock letter “G” when a revised identity system was introduced by the Railway after 1876. Two additional vans (G.5 & G.6) were supplied new by the Ashbury Carriage & Wagon Co in 1877, a single van (G.7) was believed built by the Railway itself in 1897 using spares and parts supplied by Metropolitan, followed by two further examples (G.8 & G.9) supplied new by Metropolitan in 1899, all to the same basic early-type design. Van G.1 is extant and currently stored out-of-use on the Railway. The remaining early-type “G” vans were in use until the 1960’s, but scrapped by 1975. The Isle of Man Railway inherited four covered ventilated vans of a different design from the Manx Northern Railway in 1904 and built a further five longer-body examples itself between 1915 and 1921 using redundant chassis from original 4-wheel carriage stock. 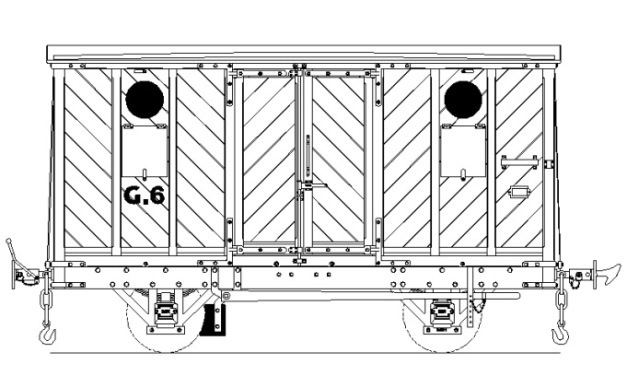 The portholes on the side panels of a number of “G” vans were modifications by the Railway to improve ventilation for carrying perishable goods, live poultry and even horses! Numbers G4, G6, G7, G9 available. Orders will be packed randomly with no two the same unless more than four are ordered. Copyright © 2019 Accucraft UK Ltd. Web Design & Development by Kalidescope Ltd.